Picture of grow light and re-purposing containers. The picture above shows the grow light and it's packaging. The lighter gives you something to scale the size measurements. 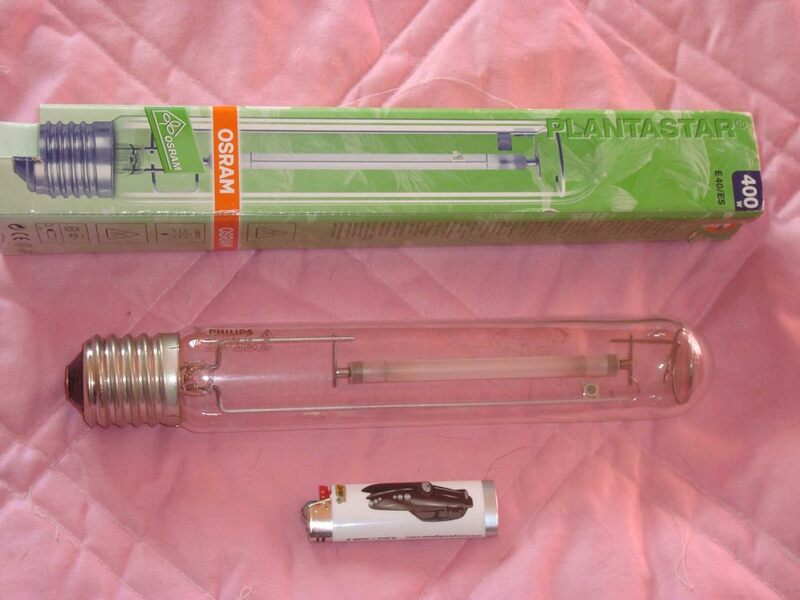 It is made by OSRAM.This 400 watts bulb is called plantastar . house plants in my windows only give light that substitudes sunlight. 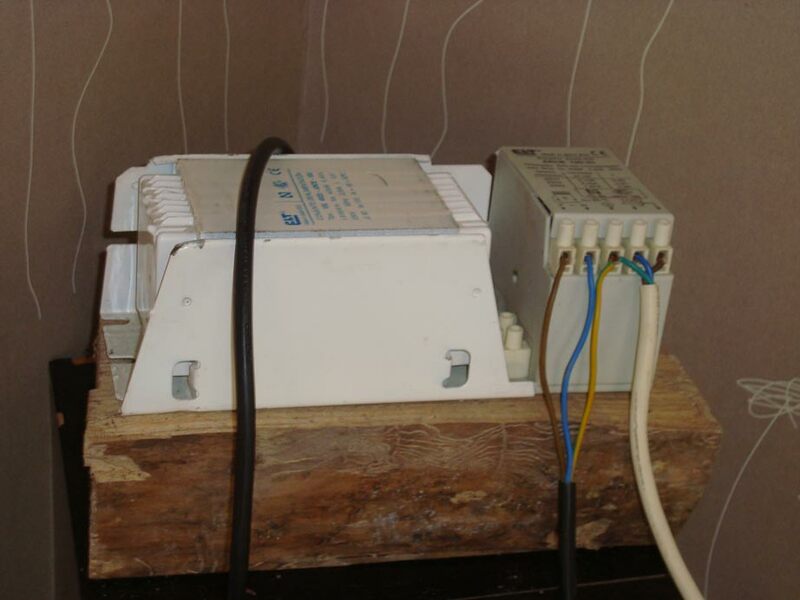 This is power source. This one light bulb lights up our whole kitchen. It makes it glow. I don’t think we really need 400 watts but there you have it. 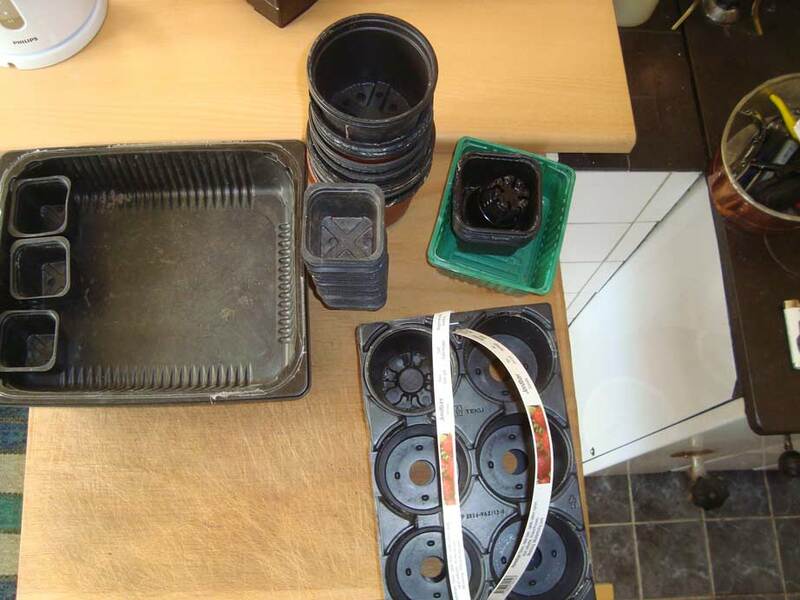 These are some of my sowing containers. I save plastic plant container from any flowers & house plants that I buy. I ask friends and family to save them for me instead of recycling them. The big rectangular container in left hand corner is a family pack meat container. You can see the small sowing inside of them. I usually use small plastic square sowing container that I buy at your local garden center, which are relatively inexpensive. I save my plastic hamburger/meat family pack containers and place the square sowing container in them. You can ask neighbors or family to save them for you like I do. I do this because the sowing container have drainage wholes in the bottom. This keeps water from seeping all over your table. It helps you to keep your soil moist, which you seedlings require. Excess water spills off into it. This is my inexpensive way of making premade sowing containers.I also save clear plastic fruit packages with lids and use them as mini green house for seeds that require that kind of germination. You can buy mini green houses like this at garden centers. I choose to recycling Things we usually throw away. I just wash them and store them for next year. We found our grow light at a second hand store. We chose to buy a grow light to put in it. You really don’t have to have a grow light. You can use flourescent lights. It works just as well. Some of our plant can be ready to plant outside in 4 weeks. They can handle our cold nights. I always place my plants outside every day for 5-7 days before we plant them outside. I bring them in every night. Then I let them stay overnight on the 8th day. Then the plants are ready to be planted in our garden. They have to be acclimatize to the outside weather or you risk them dying from the shock. The animated gif above is showing you how we made the milk carton with a water resevoir in the bottom. You do have to clean the carton of all milk residue or it will get mold or mildew.We also put gravel in the whole of the lid which keep the soil from falling into the resevoir of water at the bottom.